White_Cardboard_Mailers is rated 5.0 out of 5 by 2. Rated 5 out of 5 by Investor1 from Great sturdy mailing piece I have posters to mail and wanted to ensure they get to their destination without damage. This envelope is perfect! Rated 5 out of 5 by lee_ from great envelope The great envelope that I have ever bought.very easy to use. What is the thickness? Most mailers I see are 28pt. I need heavier. Hello! This specific item (#6PSW) has a paper weight of 130 lb. You can check out our Paper Weight Chart here - https://www.jampaper.com/paper-weight-chart.asp Thanks for the question! 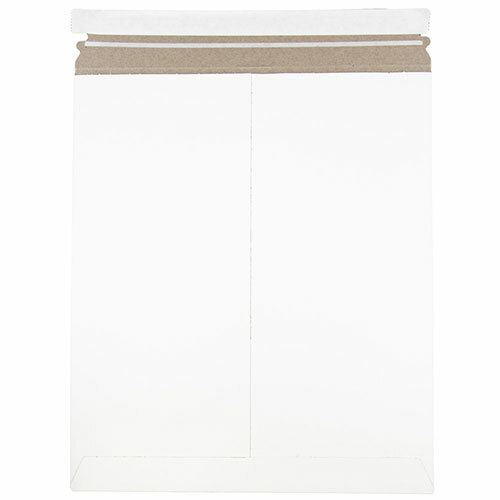 are your white cardboard tuck flap mailers, 17x 21 available? Hi Joe. Yes, those mailers are available. Can you customize this envelope? (11 x 13 1/2 white cardboard mailer). If so, I need a price quote for 1,600, one color print. Hello. Unfortunately we do not do customization for envelopes. As is, 1,600 11 x 13.5&quot; white cardboard mailers would be $1,200.00. Thanks for your question! If Leonardo da Vinci said this, it has to be true. He probably would have enjoyed these cardboard mailers, especially for storing his sketches on the human body or UFO's even before they were a thought (check out his codex). They wouldn't have been ripped, torn or bent in any way! His Mona Lisa would have been safe and sound and would have kept that weird smile on her face and those eyes that follow you everywhere. These white cardboard mailers are perfect for all of those important documents you want to keep safe on their journey to Italy. There's no need for an extravagant or ornate mailer when there are more important things to worry about that fit inside it. Don't let the white, simple color fool you - it didn't fool Leonardo! White Cardboard Mailers are extra rigid! Available with self seal closure. Expandable and thin are available. Expandable mailers are listed in pull down as #1, #2, #3, and #4. Use these if you have a bunch of documents you want to send out!